Have assets in and around your business or building you wish to monitor. Have a vulnerable population, like a nursing home or daycare. Your business is surrounded by trees, or otherwise blocked from view from the street. Have assets within your business you wish to protect. 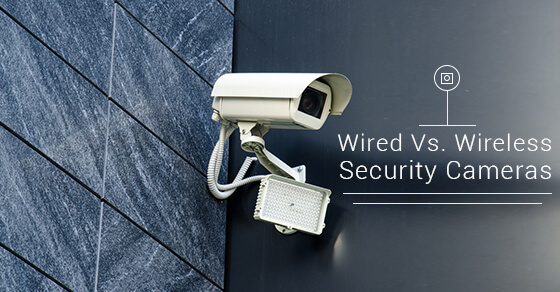 When you are choosing a CCTV system for your business, you will have to decide between wired or wireless security cameras. In this day and age, most technology tends to be wireless, but it’s worth taking a look at the benefits of both wired and wireless security cameras. No interference from other wireless devices: the video goes straight through to your recorder. Greater variety of camera styles available. With a wired camera, it’s impossible for the signal to be jammed. IP-based wired cameras can provide video resolutions at High Definition and beyond, transmitting large amounts of data over CAT5 cabling. Less flexibility: if you want to change the location of your cameras, you will need to rewire them. More flexibility when it comes to relocating cameras. Wireless cameras can connect to your already existing wi-fi network. Connectivity issues may occur depending on the range of your wi-fi network. Crowded frequency due to the overlapping of other wireless networks or channels. This can lead to dropped signals, interference, and lost video. Due to the above frequency issues, wireless cameras are generally less reliable than wired cameras. Lost signal during inclement weather if cameras are placed outside. Everyone’s security camera needs vary based on the structure of their home, location of power sources, and other individual needs. You may even choose to use a hybrid system, incorporating both wired and wireless cameras. At Fire Monitoring of Canada, our staff are trained in both wired and wireless systems, as well as hybrid systems. We will work with you to put together the very best monitoring system to keep you, your property, and your business, safe and secure. Contact our team today to discuss your security options!